On day six of Congress, the second last day, we have rain. Union Station in Toronto is flooded. Waterloo airport is cancelling flights. And the book fair is quiet with scholars staying dry and collaborating in their own scholarly associations on University of Waterloo campus and avoiding the cold wet trek to Wilfrid Laurier University campus. But the RIR booth is full with Michael Johnny, Krista Jensen and David Phipps from York and Bojan Furst from Memorial answering questions from book fair attendees. We are pleased to have welcomed questions from across Canada and even from American and British delegates. With the introduction of knowledge mobilization strategies in SSHRC Insight Grant applications, the KMb Units in the RIR network and the services we provide to grant applicants is the envy of many universities. 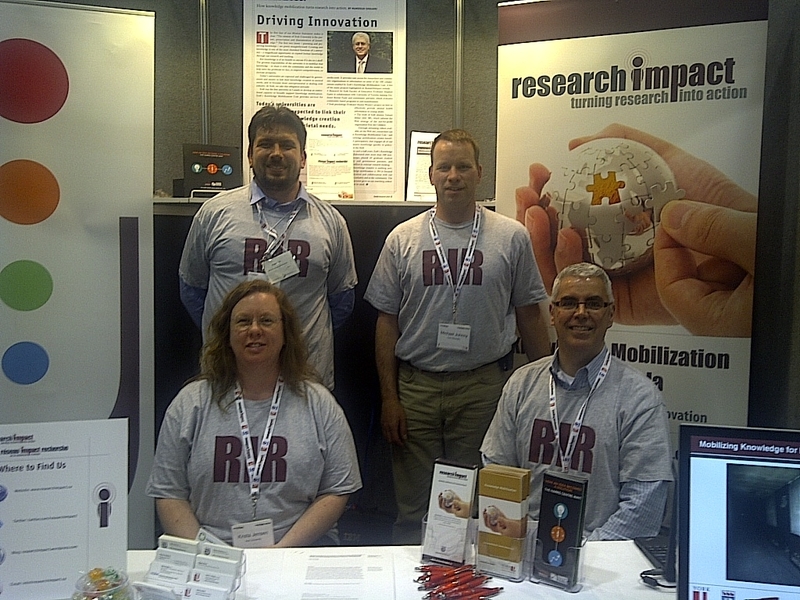 Looking back on a week of mobilizing knowledge about knowledge mobilisation at Congress 2012 we realize that this is definitely an emerging focus in Canadian schoalrship. We have had 174 substantive conversations about RIR and knowledge mobilization. We have spoken to faculty at 26 universities who wish their institution had a knowledge mobilization unit. There is appetite for and appreciation of knowledge mobilization as an integral part of engaged research and learning. But at the end of day 6 we are pleased it’s quiet in the book fair. Time for one last President’s Reception. So long as the rain lets up. And next year we go back to our knowledge mobilization roots. We look forward to joining our first knowledge mobilization collaborators at the University of Victoria which is hosting Congress 2013.